Researchers have created an interactive web tool to estimate the amount of energy that could be generated by wind or solar farms at any location. The tool, called Renewables.ninja, aims to make the task of predicting renewable output easier for both academics and industry. The creators, from Imperial College London and ETH Zürich, have already used it to estimate current Europe-wide solar and wind output, and companies such as the German electrical supplier RWE are using it to test their own models of output. To test the model, Dr Iain Staffell, from the Centre for Environmental Policy at Imperial, and Dr Stefan Pfenninger, who is now at ETH Zürich, have used Renewables.ninja to estimate the productivity of all wind farms planned or under construction in Europe for the next 20 years. Their results are published today in the journal Energy. They found that wind farms in Europe current have an average 'capacity factor' of around 24 per cent, which means they produce around a quarter of the energy that they could if the wind blew solidly all day every day. This number is a factor of how much wind is available to each turbine. The study found that because new farms are being built using taller turbines placed further out to sea, where wind speeds are higher, the average capacity factor for Europe should rise by nearly a third to around 31 percent. This would allow three times as much energy to be produced by wind power in Europe compared to today, not only because there are more farms, but because those farms can take advantage of better wind conditions. In another research paper also published today in Energy, the pair modelled the hourly output of solar panels across Europe. They found that even though Britain is not the sunniest country, on the best summer days solar power now produces more energy than nuclear power. However, the pattern of this solar output through the year substantially changes how the rest of the power system will have to operate. Wind and solar energies have a strong dependence on weather conditions, and these can be difficult to integrate into national power systems that requires consistency. If there is excess power generated by all energy sources, then some supplies have to be turned off. 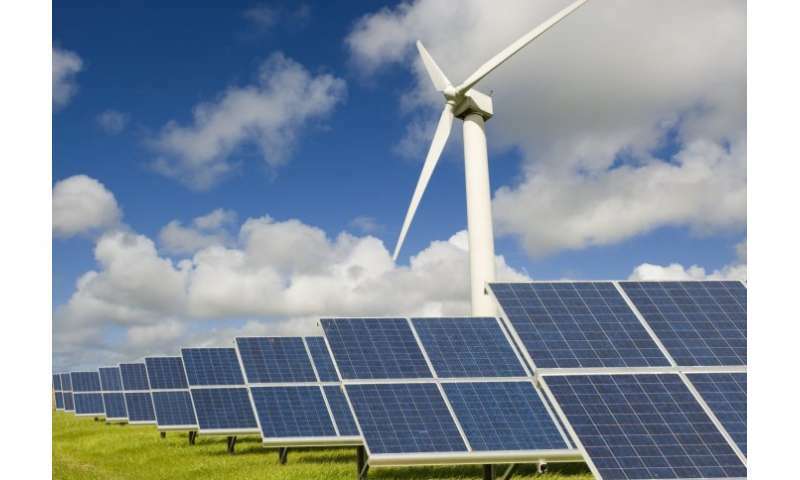 Currently, wind and solar power generators are the easiest to switch on and off, so they are often the first to go, meaning the power they generate can be wasted. Making use of a larger capacity for solar energy generation relies on changes to the national energy system, such as adding new types of electricity storage or small and flexible generators to balance the variable output from solar panels. Renewables.ninja uses 30 years of observed and modelled weather data from organisations such as NASA to predict the wind speed likely to influence turbines and the sunlight likely to strike solar panels at any point on the Earth during the year. These figures are combined with manufacturer's specifications for wind turbines and solar panels to give an estimate of the power output that could be generated by a farm placed at any location. Dr Staffell said he spent two years crunching the data for his own research and thought that creating this tool would make it quicker for others to answer important questions: "Modelling wind and solar power is very difficult because they depend on complex weather systems. Getting data, building a model and checking that it works well takes a lot of time and effort. "If every researcher has to create their own model when they start to investigate a question about renewable energy, a lot of time is wasted. So we built our models so they can be easily used by other researchers online, allowing them to answer their questions faster, and hopefully to start asking new ones." He and Dr Pfenninger have been beta testing Renewables.ninja for six months and now have users from 54 institutions across 22 countries, including the European Commission and the International Energy Agency. Dr Pfenninger said: "Renewables.ninja has already allowed us to answer important questions about the current and future renewable energy infrastructure across Europe and in the UK, and we hope others will use it to further examine the opportunities and challenges for renewables in the future."